As June draws to a close and E3 becomes a distant memory, Microsoft has unveiled the software headed to Games With Gold for the month of July. From Friday, July 1, Xbox Live Gold members will gain access to four new titles and, thanks to the Xbox One’s backwards compatibility feature, all of the newcomers will be playable via Microsoft’s current-gen consoles. Kicking things off for those on Xbox One is The Banner Saga 2, Stoic Studio’s tactical RPG that will be available to download for the entire month of July. Come July 16, though, it’ll be joined on the Games With Gold roster by Tumeblestone, a “new competitive indie puzzler from The Quantum Astrophysicists Guild” that draws inspiration from genre classics in the vein of Tetris and Puyo Puyo. As for Xbox 360, those still in possession of the last-gen hardware can look forward to Tom Clancy’s Rainbow Six Vegas 2 from July 1 to July 15, when it’ll be replaced by Disney Interactive Studios’ licensed title, Tron: Evolution. 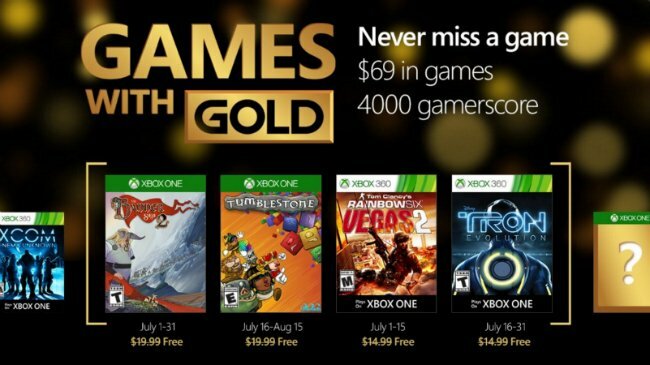 And there you have it; Microsoft has officially confirmed its Games With Gold lineup for July of 2016. Tell us, what are your early impressions of the software selection?